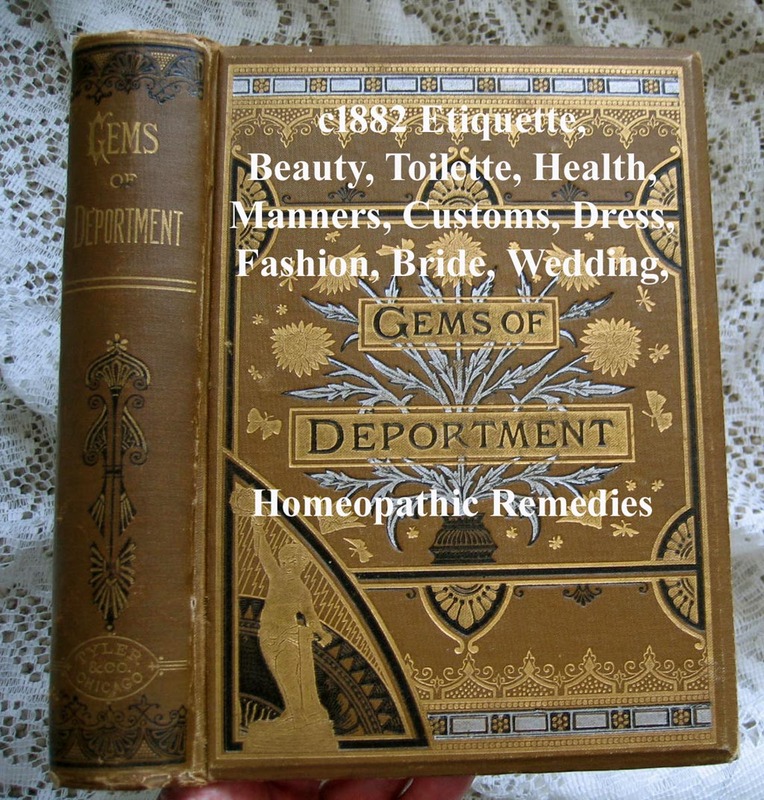 This fascinating, scarce, antique book from 1882 is entitled "Gems of Deportment and Hints of Etiquette, The Ceremonials of Good Society, Including Valuable Moral, Mental, and Physical Knowledge. Original and Compiled from the Best Authorities, With Suggestions On All Matters Pertaining to the Social Code. 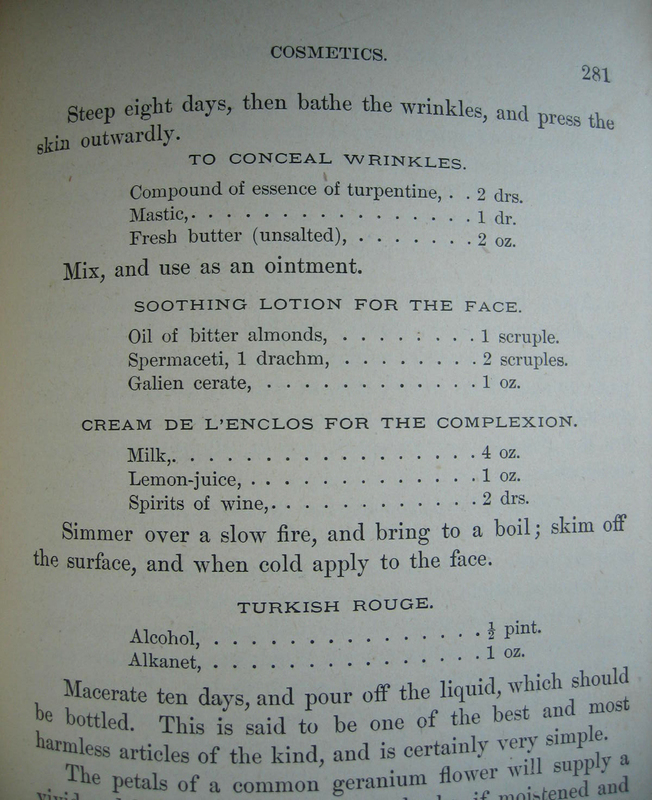 A Manual of Instruction for the Home". The author is Mrs. M.L. Rayne. Published by Tyler & Co., Chicago, IL. Books like this were essential for the home, a sort of "bible" you might say as to how to conduct oneself within Victorian society. 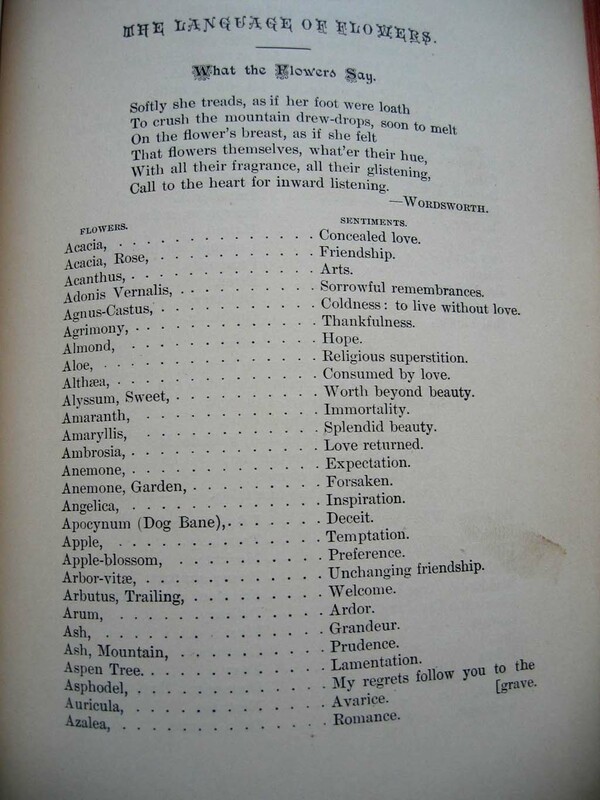 And, there is a section on the Language and Poetry of Flowers, that is, what virtue each flower symbolized, so very important in Victorian society. After reading the contents below, I'm sure you'll agree it is quite comprehensive, and would make a wonderful gift for anyone who studies etiquette of long ago. 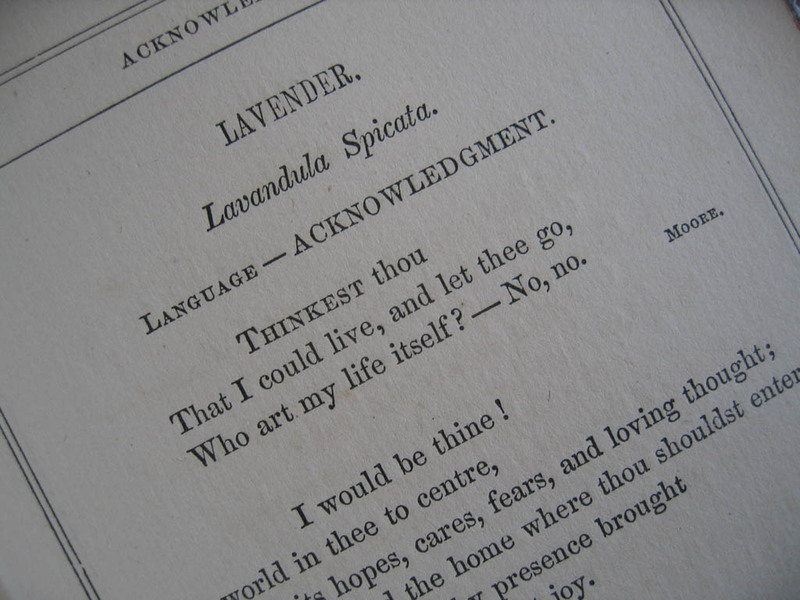 It also includes a section on the Language and Poetry of Flowers, that is, what virtue each flower symbolized, such an integral part of Victorian society. Chapter VIII. Letters of Condolence--Business Correspondence--Love Letters--Answered and Unanswered Letters--Dates, Addresses, Stamps, Punctuation, etc. Chapter XIV. Engagements--Ring of Betrothal--Secret Engagements--Behavior of the Engaged--Engagement Gifts--Announcing the Engagement--Engaged Girls--Marrying for Love--Married Lives--Advice to Young Wives, Advice to Young Husbands--Demeanor of Married People Toward Each Other at Home and In Society, etc. Chapter XVII. Divorce--Its Complex Laws--Difficulty of Obtaining it in Foreign Countries--Divorce in England--In Massachusetts, etc. This hardbound book has tan cloth-covered boards, with rich decorative silver, gold, and black stamping to the cover and spine. Frontispiece tissue guard is intact with foxing. 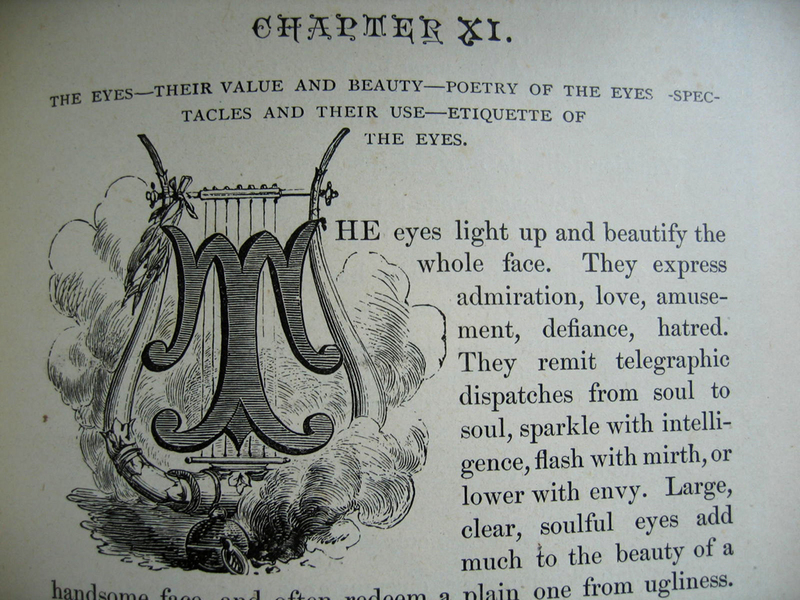 There are full-page and paragraph header illustrations. 414 Pages. 6 1/8 x 8 1/4" tall. It is in VG condition. The spine and text block are tight. The cover boards have the usual wear at the corners, sides, and spine ends, with a teenie pinhead hole about 2" up from the spine edge, and a couple other small wear holes at the spine bottom (mentioned only for accuracy). Inside the pages have a nice patina and no writing on them, and is mostly clean with a small amount of handling wear mostly confined to the front and rear pages, and a few foxing spots. The outside page edges are red tipped. The hinges are tight, all in all, this book is in remarkable shape for its age, and very RARE. Honestly, I haven't had this book for a LONG time, and probably won't get another!